BP Marketing Group will hit the road this summer for its Technology Showcase Tour. The Technology Showcase Tour is meant to highlight the increasing demand for AV & IT unification in integrated environments, with real world solutions and applications that apply to nearly every market. The tour will include products from eighteen different manufacturers. 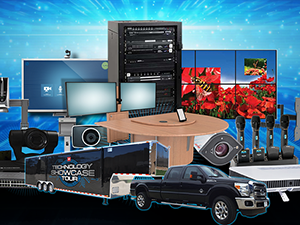 The Technology Showcase Tour will complete a seven-month, 18-city tour in 2014. The tour will have multi-day stops in each city, with different locations every day to accommodate a variety of attendees. The website includes event dates, manufacturer lists, and an interactive gallery. Opportunities to host an event on the Technology Showcase TourTM are also available upon request.